As I don my running clothes, prepare my pack, and put on my shoes, she begins to stir. Pacing back and forth in a tight pattern just a few feet in front of me, Twig knows that her presence cannot be overlooked. I move from one room to another, gathering small, forgotten, last-minute items. All the while, I have a shadow. She has no intention of letting me out the door without her. I then ask my two-year-old Border Collie mutt, “Twig, wanna’ go for a run?” It’s a question I already know the answer to, but I ask as part of our routine and to let her know it is time. Her reaction is always the same and it makes me crack a goofy grin. She does a low-to-the-ground bow with her hind end raised high in the air and her forearms and chest pushed toward the floor–this is the downward-dog yoga pose, canine-ified. This is accompanied by a vocal exhale, seemingly relieved that I have finally asked the question. Heading to the trail, she never asks about the weather, our route, or how far we are going. She just goes, with no hesitation or fear. As I bend down to unhook her leash, I get a big kiss on the check that draws up into my eye. I give her the word “fly” and she takes her first strides down the trail with what has to be uninhibited joy. It has become our routine day after day, although as the frequency and duration of our runs together have increased, I have come to the realization that I needed to learn more. It seems that my dog is no longer just a running companion, but rather she is transitioning into an athlete. I had questions about how to keep my athlete dog healthy. During our run, would sips of my electrolyte drink and bits of my gels and bars fuel her properly? For recovery, I questioned if she needed a snack with the same carbohydrate-protein ratio recovery formula that humans use. How much could she safely run on a given day and throughout the week? Would I know if she wanted or needed a day off? I looked to the Internet for guidance, but struggled to find sound information, so I turned to my veterinarian, Dr. Ryan Canales. He was kind enough to answer some questions for me. Here goes. Aliza: At what point does a dog become an athlete? Dr. Ryan Canales: That is a good question as outdoor enthusiasts are becoming more and more engaged with their four-legged companions. This encompasses anything from agility, frisbee, hiking, mountain biking, field work, law enforcement, and the list goes on and on. Dogs participating in these activities or any activity that involves a skill set or repetitive training would be considered a canine athlete. These increased demands on household dogs can take a toll both physiologically and anatomically, therefore their energy needs and other physical requirements need to be paid attention to more so than the everyday companion. I suggest that if you want a dog for ultrarunning endurance, pick a breed that can do the activity. Also take into consideration the weather spectrum that your region sees, along with the terrain on which you train. Common sense usually goes a long way when picking a dog, but I was proven wrong skinning Gulf of Slides on Mount Washington three years ago when a puggle passed me on the way up! Aliza: Do dogs and humans have the same aerobic capacity? Dr. Ryan Canales: Animals are quite different from humans when it comes to aerobic capacity. Even the untrained dog has a considerably higher VO2Max then an Olympic athlete. Many times sled dogs are used in research to test the power house of the physiological system called mitochondria. Dogs can have as much as two to three times the VO2Max of a human, considering well-trained, world-class athletes can range from 80 to 90-plus milliliters of oxygen per kilogram of body mass per minute. Dogs are not much different than humans in the way they still need carbohydrates to fuel the Krebs cycle to burn fat, but because they have so many mitochondria, they are much more efficient in burning fat. It is also known that dogs that are rested for months in their off season can then come back to running multiple miles a day much faster than a human because the number of mitochondria remains relatively the same without exercise. This also allows dogs to be able to increase the amount of exercise at a more rapid rate compared to humans. Aliza: Do canine athletes have special dietary needs? Dr. Ryan Canales: Canine athletes have much different energy requirements than human athletes. Many human athletes rely on a high-carbohydrate diet because they increase muscle glycogen, but in dogs they have the reverse effect. Because of the number of mitochondria that dogs have, they are very efficient machines and can burn fat as energy. Diets that are more beneficial for athletic endurance dogs requires roughly 20 to 22 percent fat on a dry-matter basis, 30 to 34 percent protein, and 50 60 percent carbohydrate. Aliza: Should dogs be given the traditional runners’ gels, drinks, or bars? Why or why not? Dr. Ryan Canales: Yes and no. This can be a loaded question because each individual dog can have different needs, just like a human. You can use the human products, but you need to be careful of the electrolyte content. This can cause digestive upsets, the same way as people. Again, this is not cookie cutter for all dogs, but roughly one gram/kilogram of body mass/hour of carbohydrate is a good number to start with when considering how much a dog can take in to keep the furnace running. I personally use a product called Glycocharge that I mix into a paste or add to the dog’s water. You can carry this with you in Ziploc bags. Some people use Karo syrup as well. I will also use Yaff Bars, which are made for human and canine consumption. Again, just be careful as with people, dogs need to become accustomed to this and what works for one may not work for another. Aliza: Any advice on hydration for exercising dogs? Dr. Ryan Canales: You should make sure that there is plenty of fresh water available. I carry a CamelBak just for the dogs if I know that fresh water, like streams or other bodies of water, will be minimal. Glycocharge will help dogs drink that don’t seem interested while panting. On the other hand, it is horrible for their teeth, like gels are for our teeth. (Make sure you brush your dog’s teeth on a weekly basis.) Sometimes, just stopping and encouraging your dog to take the time to drink and cool off can help them feel less apprehensive and less rushed. Aliza: Should a canine athlete eat following a training session like a human athlete? Dr. Ryan Canales: Absolutely, the quicker you get food into them to replenish glycogen reserves, protein, and fat for recovery, the better they will be to go again the next day and the next. High-density, high-calorie foods are much better than low-calorie foods as you feed much less. Look for a diet that contains roughly 500 calories per cup. They do exist. Also no different than a human, you would like to get some calories into your canine within the 30-minute window. Aliza: Are there signs/symptoms that would alert an owner that their dog is over-exercising or not getting the right nutritional intake to support their energy expenditure? Dr. Ryan Canales: An endurance canine is going to look much different than a typical house dog that goes for short walks. Many people will tell you your dog is too thin. We use the Body Conditon Scores (BCS) scale that ranges from 1 through 9. On this scale a 1 is emaciated and a 9 is obese, and athletic canines I like to see at a 4. Please understand this is breed specific and that the BCS scale is subjective. One condition owners should be aware of is exertional rhabdomyolysis. This condition can occur in dogs that are not conditioned properly and can be seen in athletic and working breeds. It can be life-threatening and it results from a dog overworking to the point that their muscles become damaged on the cellular level. Signs to be on the lookout for are if your four-legged friend is unwilling to go for a run, over-sleeping, has brown-colored urine, a sluggish gait, tail drooping, stiffening up while out running, and the list continues. Most importantly, if your dog seems disinterested in something they usually enjoy, take this as a serious warning sign and consider seeing your veterinarian. Aliza: Is mental exercise just as important as physical exercise for dogs? Dr. Ryan Canales: Absolutely, dogs that are doing something repetitively can become extremely bored or just don’t want to do it any more. They need a mental break. The most important take-home message is, keep it fun. Like people, we are rewarded by satisfaction/gratification. When we are not satisfied any more, we tend not to be as good at what we are doing. Example can be when conditioning a dog. Most dogs that are running 50 to 100 miles a week love it, but if not conditioned properly they may quit or become injured. These are signs of over-exercise, too. Just remember that endurance dogs should have some down time, too, just like their athletic owners. Remember they recover much quicker than humans mentally and physically, but also beware as your dog maybe ready way before you are! 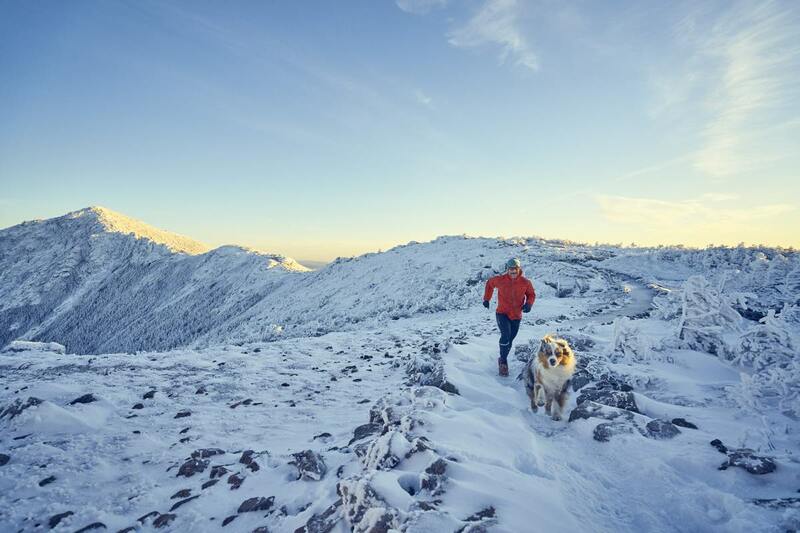 Also to keep things fresh, remember that your canine-athlete friend can take up other sports to break things up a bit, like backcountry skiing, hiking, and practicing commands and learning new ones is also a great way to help work your dog mentally and physically. To date, Twig’s longest run has been 26 miles with over 10,000 feet of ascent. She has shown she can go further and faster, but for now we are trying to keep a balance of mental and physical activity. Between my husband and I, we have taken her all over the place skiing, biking, hiking, and running. Unfortunately, she has yet to find her love for the water, but we will keep trying to encourage swimming. Nonetheless, no matter what the endurance adventure, I have found that the best way to keep her fueled is to feed her snacks whenever I eat, which is typically every 30 to 40 minutes. Her favorite on-trail snack seems to be salmon jerky with a smear of peanut butter. She and I are also big fans of Yaff Bars as we can share them, which keeps packing simple. In the beginning, I griped about carrying the extra supplies, but now I have made it common practice to carry extra water for her along with ample snacks. I just tell myself that the extra weight will make me stronger and keep her healthy and able to accompany me out on the trail for years to come. Day after day, I am excited to plan adventures where Twig and I can explore. No matter how muddy my little mutt gets or whether she eats her portion of calories and part of mine, having her as a companion on and off the trail has been a gift. Sometimes I call my canine athlete a curse, but that is just because she frequently and elegantly out endures and outwits me. It surely has been a learning process going from a household dog to a much more athletic dog, but with the help of Dr. Ryan, we have made great progress. 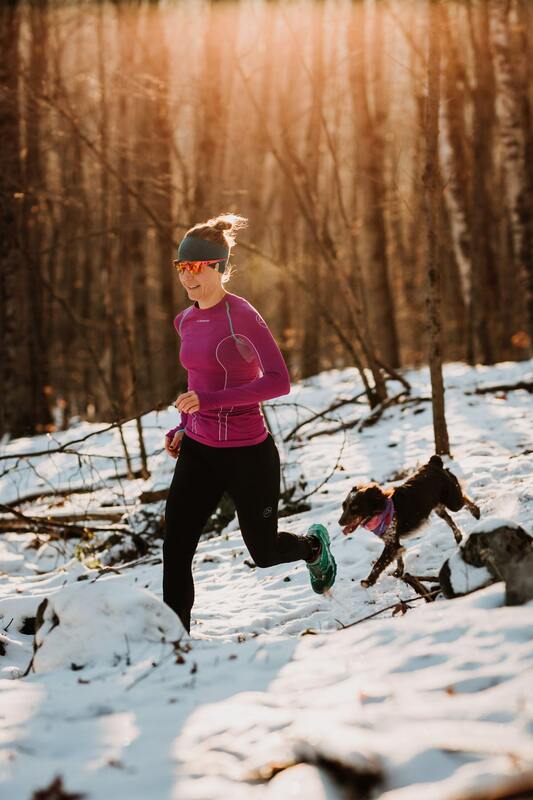 If you’re the owner of a trail running dog, what have you learned about keeping your pooch happy and healthy on the trails? Do you have any live-and-learn stories about what hasn’t worked for your dog in terms of food, hydration, heat, cold, and other health issues? Nice article. I’m wondering how old a dog should be before running long distances, and at what age (or what signs) that it is time to retire from running long distances. I thought I may answer your question, as I am a veterinarian myself. Please note that the following are suggestions only, and individual applications may vary. For owners interested in having a true running or exercise partner, I get started early on the topic of joint health. I typically advise clients to ease into any endurance activity slowly. Starting as a puppy, just take the dog for long walks and hikes on trails to develop their strength and proprioceptive abilities. Don’t do any running for at least 10-12 months, and when you do, start small and slow. No long runs, just a mile here or there for awhile. Depending on the breed, adulthood typically starts around 12 months. At this time, you may gradually start to increase the workload to several runs a week. By 18 months your pup is fully grown, and if you have taken it slowly, they should be well acclimated to the exercise demand. Another bit of advice: for those interested in running, especially for large breed dogs, I also have owners start their pup on joint supplements until 12-16 months of age. Why? Aren’t joint supplements for old gimpy dogs? Yes they are, however young animals are rapidly growing and can incorporate the joint healthy substances into their cartilage and articular joint surfaces much more efficiently than an aging animal with diminished healing capacity. This is more of a preventative step for dogs intended to be active. Glucosamine with chondroitin is recommended, and can be purchased over the counter. To know when to stop or slow down for an aging dog, again it may be individual specific. I’ve observed breeds like springer spaniels and german shorthair pointers having much more capacity for work at later stages in life, as compared to say, a golden or mellow lab. So age isn’t really a static guidepost here, and I think it may be important to consider what the workload on the animal is telling you. Is it sore? Is it interested in getting out the door? Listen to the signs the pet is telling you. Also, even if there are no overt signs, it may be prudent to schedule in some rest a little more often for our aging pets. Their pain tolerance and toughness far exceeds ours, and i’ve seen plenty of dogs who cant even walk (for other reasons, not just running) that are still mentally motivated to do so. So in a sense we have to protect our canine companions because they don’t exactly know how to put limits on themselves. They will go to the ends of the earth to spend time with us, sometimes to a fault. And that dedication and friendship is what we love about dogs but our job is to keep them healthy. trails that mandate you do so. Google: Dogs stress wildlife. People like Aliza running as she describes with their dogs off-leash disturb the wildlife and are a nuisance to everyone else on the trails. Spoiler, not everyone likes your dog running at them out of control. 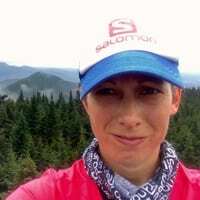 Ironically, Aliza claims to “find peace and a sense of belonging while trail running”; here she writes about being self-centered, disturbing others’ peace on the trails and bringing stress to the wildlife that actually does belong where she runs. This site often talks about being stewards of the wild, but this piece promotes behavior that is the antithesis of that. I’ve also read that humans stress and disturb wildlife. @Trail Runner: You do not know the details of where the author runs, so please don’t be so quick to judge. I’m pretty sure most people are happy to see well behaved dogs even off leash. Nope, I hate dogs off leash. I got bitten twice and the wild life is not happy about them either. Many trails don’t allow dogs off leash but nobody cares because their dog is so cute and it had not bothered any runner until right now. Why not just bring dog food in a ziplock bag ? Sounds healthier, easier and cheaper than human food. dog food in a ziplock bag doesn’t really work, since most dog food is made for sedentary suburban dogs, not for athletes..
My dog is a field-bred English cocker spaniel. (see him at the link from my name). On a day’s upland bird hunting I’ll walk 10-15 miles across country, he will run two to three times that distance through heavy cover – cattails, brush, thick grass. The biggest problem I have outside hunting season, is finding somewhere he can run off leash to get enough exercise. Typically this involves a 45-60min drive to find a bit of National Forest that doesn’t have leash laws, and not too many people. Most trails have leash laws..
We do run together with him on a leash. This is an excellent simulation of downhill running for me since he pulls like a steam train, and I’m braking constantly: believe it’s good for him too, rather like the runner drills where you pull a tire.. Both of these are to avoid intestinal torsion, which can kill. Also the research shows the dogs perform better and have better endurance on an empty stomach. – after the hunt water immediately with Glycocharge or similar. Then feed dogfood after about 90min. The fat in the dog food can inhibit the carb uptake otherwise. In snow, paws get treated with Musher’s Secret paw balm before and after the run/hunt. Hunting dogs can actually run themselves to death, so need to keep a close eye on them for excessive panting, failure to urinate, etc etc. This season we started on a day with bitter cold driving rain that turned to snow, even in his neoprene vest he became chilled. I ended up carrying him a couple miles back to the car inside my hunting coat, getting an occasional affectionate lick on the ear for my pains..
Can we add a poll ? my heart literally races when i hear people talk about running with their dogs off leash on a trail. My border collie and i enjoy hours on the local mountain trails every weekend and seemingly the result of the law of averages we’ve had our share of trips to the emergency vet when offleash dogs who “are always friendly” have torn holes in his legs or abdomen. Seeing any offleash dog floods me and my dog with adrenaline for fear of it happening again. Your dog may be well behaved, or they may have an off day when reacting to my border collie’s “stare”, but the point is almost everywhere it is irresponsible for you to put me in the position of deciding if me and my dog are safe when your dog is off leash. No matter how well behaved you think your dog is, they still have agency to act how they feel in any moment and because they are so much better athletes than we are, we can’t really do anything about it when they decide to do something we don’t want them to while off leash. if your dog is off-leash in an area which prohibits it (thus others are reasonable to expect your dog to be on a leash), you are making others take responsibility for the risk you are taking, which in my opinion is despicable behavior. I add my voice as loudly as possible to Trail Runner’s points as well as Keith’s. Thanks Aliza. That is great information on keeping our pups safe and happy. I have to say, I am surprised at the negative feedback of dogs on the trail, especially since they can make a solo female runner like myself feel safer. There is nothing more natural than a dog running off leash in the woods in my opinion. If they are not bothering you, what’s the problem? Perhaps it’s a fear of dogs in general? Are you worried about stressing mountain lions? They do bother people. Dogs bite a lot of people (and other dogs) every year. That is the problem. There is good reason for people to fear dogs (reference dog bite stats below). “Nothing more natural than a dog running off leash in the woods”, umm yea seriously.. Your dog would not last two days in the woods. I know you are being a troll with all this and the mountain lion shtick but like I said, just google it. Anyway, the trollish comments here that try to marginalize the issue or generally shift blame to the victims, definitely reveal the character traits or the people side of the problem we are trying to talk about; they simply further demonstrate the self-centered nuisance they are to others. Unfortunately, this reflects poorly on iRunFar and the trail running community. Yup, I love to see my dog running off leash, but I always scan far ahead on the trail so I can leash him up if others are present. On blind curves I call him to heel. He’s a retriever mix and he is crazy in love with people, so at his young age this involves a lot of jumping and pawing – I’m sure folks don’t all love that. Keeping hypervigilant helps me to detect animals and animal sign so I can work on keeping him from darting immediately after a distraction. He is just starting to get that I don’t want him chasing ANYTHING, but the instinct is strong. I’m concerned a bit by the stress his chasing causes for prey animals and smaller carnivores, but he has not been on an extended chase and he has not caught anything – I am bound to make sure he stops chasing before either of those things happen. I am concerned more with him going after something that can kill him, so I want him to be better at not chasing for trips into elk/moose/bear/wolf/mountain lion territory. That said, this Montanan was SHOCKED to find out National Forests in Arizona have leash requirements. Yikes! So many people! I was told not to run him regularly until he was at least a year old. For breeds on the larger side (adult weight above 50 pounds round about) the advice was to wait a bit longer even. Thanks to my own injury and nasty wildfire smoke I didn’t get to start running with him until he was a month and a half beyond a year. Still, he was such an energetic pup he ran way more on his own than I ever would have taken him and with high-impact, scary-tight turning and jumping, so I don’t really know if ‘disciplined’ running over a long distance would have been a detriment. Still, glad I was forced to be conservative. My last dog ran well until he was almost ten, then I was smart enough to retire him and he carried on proudly to fifteen. Grumpy Wednesday it seems. I don’t know where Aliza runs so I cannot say one way or the other if it’s appropriate for the wildlife. However, I will say that I leash my border collie Pedey for all of our runs for HIS safety. When we’ve run out West, I want him safe from rattlers, mountain lions, and bears, but even here in Ohio we have plenty of coyotes that I have no interest in provoking. I also don’t want him falling off a cliff on a blind curve or something similarly dangerous/avoidable. As far as human interaction, I want folks to be comfortable with him and I also want to avoid interactions with nervous or overly-excited people because it can take many minutes of running afterward for him to fully cycle out the passed on anxiety. Bark bars, rx bars, and bacon work well for on trail snacks. We always refuel on vegetarian tacos immediately after a run because it fits our need for fats, proteins, and carbs, and it’s tacos so it makes a great post run reward! We were told by our vet that he shouldn’t run any sort of significant volume for a year because his bones needed to fuse (and larger breeds could take up to 18 months) so be sure to consult a vet familiar with athlete/working dogs before you start really training hard with your pooch! I like to see well-behaved dogs running off-leash on appropriate trails. I won’t take my dog running (off or on-leash) on busy trails. It’s just not worth the hassle. Having been bitten 3 times by on and off leash dogs while running I completely understand people who don’t want to encounter off-leash dogs on their run. Those first few seconds of mild panic when a big dog comes around the bend off leash with no people around… Maybe keep the dogs on the seldom used trails and obey the signs regarding leashes? I am on to my second trail-running dog, Ben the Border Collie. Ben loves to run but doesn’t do well in the heat. I keep his max distance to a nice reasonable 6-8 miles at a time. If I want to run more than that I drop him off at home and continue on without him. I used to unleash him on trails but one day he split the webbing on his back foot chasing squirrels. I also had a very hard time controlling him around cyclists, horses, skateboarders, etc. I keep him leashed all the time now. I run early in the morning and running with a dog is a safety requirement for me, just like reflective clothing and having my phone with me. When Ben doesn’t want to run anymore I will be getting a second dog, husband already notified! This was a great article, I learned some new things about dogs, thank you Aliza! Great article! I have a Vizsla that cries to go to the trails. He easily puts 40-50 km runs. Great article, thank you! Curious about the feeding in the a.m. still. My Vizsla hunts as well as runs and I always feed him in the a.m. thinking it will be energy for the day. Don’t come to Nor Cal people, dogs off leash everywhere! Mine just did 34 miles off leash the whole time, loved every step. Saw 15 or so bikers and 5 or 6 horses. The only dog he was sketchy about, was leashed. It’s the Indian not the arrow in my mind. Train your pooch well. Take them to snake school, teach them how to act around horses, bikes, use e-collars etc etc. Training them is part of getting a running buddy. I do try and run less populated trails. As to not worry about all the b.s. the others speak of, but sh*t happens, it’s part of trail life. Just be try and remember most people aren’t taking their pets out on the trail to look for fights or scare hikers. Be considerate, tread lightly. First, if you have a dog with known aggression problems, a history stirring up problems with other dogs, an inability to be controlled, or terrible manners around humans than of course YES, please keep your dog on leash or make sure you’re a long ways off from other people/dogs if you let them off leash. – I LOVE seeing dogs off leash on the trail, to me its almost more natural seeing a dog running out there than people. They might be domesticated, but they’re still animals, and I don’t think they belong more on your couch than getting some time to run freely in the outdoors. – Unless you essentially hide your dog at home or away from all other dogs entirely, you and your dog are bound to have one or multiple bad experiences at some point or another. While you can be proactive and smart to limit those experiences, I think it’s the reality of dog ownership. So far all of the injuries inflicted to my dog or by my dog have always occurred in “controlled” environments like at daycare or a dog sitters, or some place people are told to take their dogs for off leash time like a dog park. I’m not discounting that peoples dog’s have been hurt while out on the trails, just that if your dog spends time with other dogs anywhere else, I think the odds are stronger that it will happen there. – In my experience dogs on the trails interact far better when they’re both off leash – far better than when one is on and one is off, but even better than when both dogs are leashed. Yes, if both are leashed and both dog owners take a WIDE berth on the trail you can prevent any interaction all together, but on many of the trails I run, they’re too narrow, and often include drops on the side that force people/dogs to walk directly past each other. – If you’re not opposed to them, and you use them appropriately there are tools like electronic/training collars your dog can wear that give you further “control” or ability to communicate with your pet when they’re off leash and not tethered directly to you if you’re worried about your dog exploring too far out, or chasing animals. I love running with a dog, but only if it is cold enough (below freezing at least). My wife prefers running with 8-12 dogs (ok, she’s a musher), but I get the one who prefers to solo. ALWAYS attached to me. I run canicross style (skijor-style but running because we hardly ever have snow that is ok for xc skiing). Shoes or snowshoes for me. The thing about running loose is you NEVER are as in control as you think you are (of you or your dog). I live in farm country and rarely encounter people during the winter, but there are sometimes snowmachiners, there are deer, rabbits, coyotes, grouse, who knows. In the fall and spring (if it is cold enough to take a dog), there might be farm equipment, hunters, etc. Dogs are great company, they get sooo excited to go for a run, and I definitely leg speed or simulated “downhill” training when hooked to a dog, but I would not want to risk my dog by having him/her run loose. Answer- nearly always a samoyed. The AK huskies are way too fast for me. The sams I run with adjust their pace to me. oh, forgot to mention skunk encounters (that is a fall or spring thing, though. not winter). My (almost) 8 year old border collie mix loves running with my any time of the day/night. In the winter months she will run upwards to 2 hours with me but in the warmer months she struggles to do 45 minutes. I am always impressed with how much she runs and at the paces I go. She regularly runs ~1,000 miles a year. and always always on a leash that goes around my waist! Great article! Is there any figure about how much calories a dog needs if he/she runs. Something like x kcal per mile per kg bodyweight? Love the article and I love running with my dog. Keep yummy soft treats handy so they come to your side and heel when you approach people or other dogs. Some people are simply scared of dogs and some dogs will sense it. My of leash pooch is my best running companion but I train him constantly. He is my responsibility. Ah the memories of a younger dog, mine is 8 or 9 and has the beginnings of some joint problems so the new range is 15k or 3 hours not the 70km or 14 hours of days gone by. Doug K has a lot of good advice which I mainly follow. Run on trail hounds! @Trail Runner, your statistics are relatively worthless to this discussion in that they don’t (1) address the specific number of those bites that occur on trails or (2) whether they occurred while the dog was leashed or not, or (3) relationship of the dog to the person who was bitten. I’m pretty sure no one here has claimed dogs don’t bite people, that’s not the point. Using those statistics haphazardly as a means to propagate fear is poor form. I’ve personally been attacked/bitten by dogs 3 different times, including one rather serious incident as a child and I still think that’s a weak argument for forcing all dogs to be leashed under all circumstances on the trail. For the record, only one of those bites occurred on trails and it would/could have happened whether the dog was leashed or not. It is the responsibility of trail-users to follow the rules and laws of the public areas they are using. If that area has a leash law, then a dog needs to be leashed; no exceptions. Even if your dog is a highly trained, socialized, best dog on earth, you are not above the law and it exists for a reason. If you don’t like this and want your dog off leash, seek out an area where this is allowed. If that doesn’t exist, take action to change the laws and legislature of your favorite running areas or parts of the areas to allow off leash dogs. This way other users of that area are aware that off leash dogs are allowed and can decide if they still want to hike or run there. There is widespread blatant disregard that hikers and runners have for leashes on their dogs, especially since many dogs have poor recall and limited training. It is terrifying to have an unknown canine run up to you in an aggressive stance during a run, with their owner languidly walking 100 yards behind them and calling out the dreaded but ubiquitous ”don’t worry, he’s nice’. Animals are highly unpredictable, be is prey animals (horses) or predators (dogs and cats), and hunters have a strong chase drive for running creatures (e.g. human trail runners). In public lands we must be stewards of the land and must either follow the laws that exist, lobby for changes or amendments to the laws we disagree with, or seek other areas/private areas if we will not abide by the laws set forth for the safety of all land users. Unfortunately dog owners always think their puppy is the best in the world and they don’t need to follow the law.